7 essential business management tools you cannot set aside! 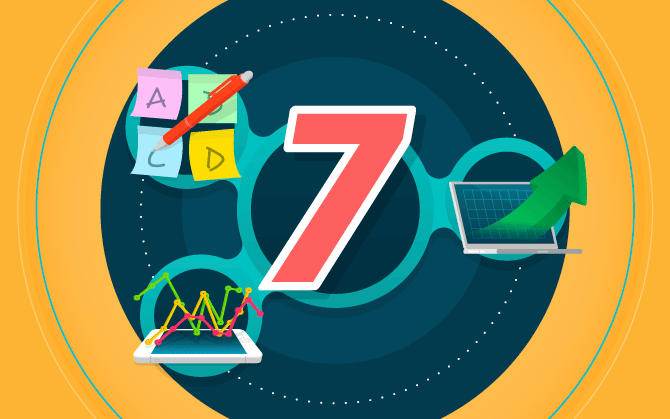 Learn about 7 resources that can help optimize your routine. Lots of people are looking for management tools or simply any kind of application to improve their routines. These resources can help us organize what we need to do on a daily basis, and allow us to clearly visualize everything that still needs to be done. For those who work on the Internet, this type of tool is very important, since it isn’t difficult to become distracted due to the constant possibilities of online distraction. And for those who work by themselves, this is even worse as there are several different tasks that need to be completed, often with deadlines. To help you optimize your routine, we’ll show you 7 management tools and we’ll talk a little about each one so you can understand how they work. What are business management tools? Management tools are all those techniques and strategies that can be used in order to improve production and processes within a company. Their main objective is to increase the control and knowledge about the procedures of the entrepreneur in regard to the company itself and especially, to guide people responsible for certain tasks and help them understand what exactly needs to be done. Unfortunately, it’s very common to find managers who don’t know every single process of the activities carried out in their area. This can be explained by the large amount of tasks they need to do at the same time. Moreover, you may also have people who work with you, know the business’ procedures but don’t understand how efficient they are. Whatever the case may be, the quality of the services provided may suffer during production or in other processes mainly for lack of knowledge of what is happening in your business. That’s why it’s so important to use management tools. They help maintain better control of all processes within the company, boosting efficiency of those involved in each of them. In addition, organization is one of the essential pillars that help keep the company up and running and increasing its efficiency. Now that you’ve understood what management tools are, we’ll show you 7 that we think are essential to help your professional organization skills and your business. A business plan is a strategic document that aims to present objectives and goals while also presenting the vision of the entrepreneur to other members of their team or future collaborators of the business. Moreover, the business plan allows you to start executing new marketing strategies and to identify your audience and their characteristics more assertively, considering you’ll put all the information about your company in the plan as well as the the actions you need to take. Canva is a management model. It combines tools, techniques and a methodology that enables innovation on companies’ daily processes. The main idea of Canva is to save, entrepreneurs who are opening their businesses, from a headache that a new venture can bring. In Canva, you should follow 7 steps that will later become 7 blocks in a frame or any other surface that can be used as a frame. Each block has post-its on it, detailing specific terms and concepts of each step. Monitoring: how to manage, measure and verify the results of the planned actions. The PDCA is an acronym consisting of four terms: Plan, Do, Check, and Act.This four-stage approach is a pillar of this management tool that aims to improve processes and solve issues. To plan means, in this context, to discuss with your team all the current circumstances of the company. Brainstorming is essential so you can talk to all employees and develop new ideas that can lead to better results. The PDCA cycle needs to have a starting point: a problem to be solved. And you need to know the reason behind and its reach. There are a number of attitudes that can contribute to making sure everything goes as planned. Defining norms and rules for the employees’ actions. At the end of the process, after the systematic tests, all failures and successes must be listed. If the main targets were met then it’d be useful to analyze what contributed to that success, as well as observe what contributed to the failures in case there were any. Within this stage of the PDCA cycle, everything needs to be monitored and measured according to what was planned. The expected target should be compared to what the actual result was . It’s important to review the methodology applied and, depending on the results of the previous step, it may be necessary to change strategies and processes in order to obtain different results. If the action plan has met all the targets or at least most of them, then you should definitely adopt them within your business structure. If not, it’s essential to re-examine the assumptions made within the planning and then find the cause of the problem and possible reason that led to your plan’s failure. Another management tool that can be very efficient is the 5W2H. It’s a simple and PDCA-like planning method. This method works as follows: you ask seven questions and respond to them intuitively. Within the answers, you’ll list activities and attitudes that need to be carried out in order to put the project into action and get it off the ground. Why: why the action will be carried out? How: How will the action be carried out? How much: how much will the action cost? After answering the questions, there will be a complete list to be made in order to produce a project that will be effective. SWOT analysis is a management tool used to describe variables within a company. They are the strengths, weaknesses, opportunities, and threats in a specific business. This is a well-known, commonly used tool in business administration today. Short-, medium- and long-term planning can be well structured and accomplished when used within this strategy. The idea of ​​a SWOT analysis is to create a framework that assists business owners and managers when making decisions on a daily basis. As a whole, the table works as follows: you name the business’ weaknesses, strengths, threats, and opportunities and analyze, compare and contrast them side-by-side. Within a specific situation, making decisions becomes more rational when you use this tool, since it enables you to have a macro view of what is, in fact, working and what still needs improvement in your business. Key Performance Indicators (KPIs) are a management tool used to measure company performance. KPIs, in general, are a great way to understand how all of the companies procedures are carried out and and if they, in fact, are working effectively in achieving the company’s key goals. Keep in mind that there are several types of KPIs. Conversion rate, for example, is one of them. The most important thing is to understand what your goal is, so you know which KPIs would suit your needs. Finally, we’ll discuss marketing mix, also known as 4Ps. This is a concept based on the four pillars of marketing: product, price, promotion, and place. We will speak briefly about each of them, so as to clarify what they are and how they can affect your business. The product which adds value is very well accepted by customers, and we’re not talking about price here, but about the characteristics and quality of what you offer to your customers. What demand does your product meet and how does it do it? What is the difference between your product and the competitors’? Price is what generates the profit for the company and also what defines if the product is or not desired by specific customers. When you set the price of your product, remember that it must be necessarily set according to the market’s demands. But if a product meets a very specific demand in which customers don’t mind paying more to get something unique or with very high quality, then their price may be higher. How much is the competitors’ product? How do specific circumstances affect the price of my product? Would my client be willing to pay more for my product? Place refers to the route that customers go through to get to your product and the way in which they get there. In this case, it’s key to think about the distribution methods. Place also involves analysing where the majority of your customers are and how the products reach them. Can I improve my distribution channels? Can I improve my team so as to reach more customers? What do I need to change to improve the efficiency of my product distribution? Promotion is the step in which you observe what kind of attitude adds value to your product and what are the best ways to promote it. Watch the results of online posts to analyze the time and day when the reach is greater. In short, all of these management tools help you optimize processes within your business. So, it’s up to you, as an entrepreneur, to understand which processes need, in fact, to be improved at every stage of your business. It’s essential to keep steady, good management on your business so that you don’t have unforeseen expenses and especially, to take control of all the actions necessary to improve your results. In addition to process management, it is also essential to divide your time well so that everything you plan can be done with agility and according to what was planned. If you need help doing that, check out our post with 10 Time management tips to increase productivity.